Joseph Brodsky (1940-1996), like Nabokov and Solzhenitzyn, was a writer in exile, and is considered one of the great modern Russian poets, alongside Akhmatova, Pasternak and Tsvetaeva. In 1987 he was awarded the Nobel Prize for Literature. This, his second collection of poems, was first published in the West in 1980, and includes poems originally written in Russian, translated (often in close collaboration with the author) by poets such as Anthony Hecht, Derek Walcott, and Richard Wilbur. It also includes his poem "Elegy for Robert Lowell", which Brodsky wrote himself in English. 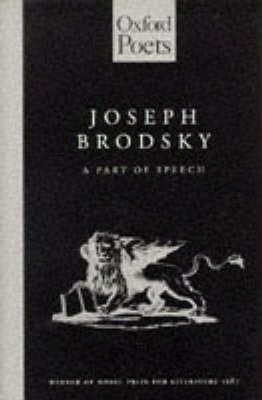 This reissued edition has a new introduction by Brodsky's friend and translator Anthony Hecht, which gives the background to Brodsky's enforced exile and sets out his total commitment to poetry.